In these dark days it’s good to have reliable companions, friends that will stick with you to the bitter end. But in a pinch, a dog will do. Faithful Hound is an Action-Reaction card, like Moat. And just like Moat, it draws you two cards when you play it. The reaction is quite different, though. When you send a Faithful Hound away, it comes right back as an extra card in your next hand. You might never even play your Faithful Hounds, just discarding them to Cellars and the like. And like most Reaction cards, Faithful Hound can help against some attacks. It’s nice against Attack cards that make you discard from your hand, like Militia. But maybe sometimes you’ll get lucky and a Bandit will flip your Faithful Hound. Hope springs eternal. Faithful Hound doesn’t have an Heirloom, look at that. It’s an off-theme preview! Tomorrow’s bonus preview will have an Heirloom to make up for it, I give you my word. I dislike the art. This really is a guilds expansions, it continues the theme of weird art. He's not so much a cunning bloodhound as the addle-brained mongrel that follows you around unwanted. Combos nicely with Vault - play Vault, discard the Hounds for coin, get a bigger hand next turn to get even more coin from Vault. Isn't something like "your" or "the" missing in the end of the text? Put it in your hand at the end of **** turn. Does “at end of turn” mean “at end of YOUR turn” or “at end of ANY turn”? EG if I discard it to Militia do I immediately get it back before my turn starts? Any turn. So yes, if you discard it to Militia, you'll get it back in hand at the end of that player's turn. 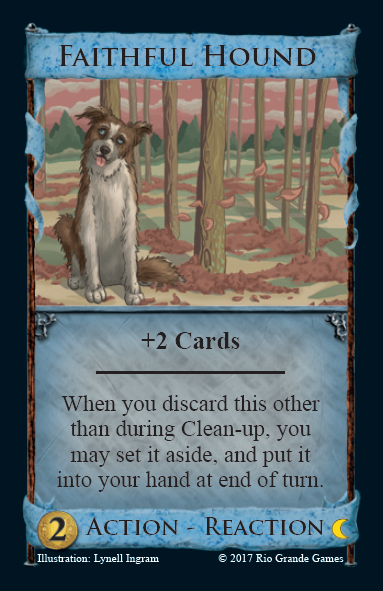 So it returns to your hand after cleanup if discarded on your turn? Donald must have had this in mind at some point during the design of this card, right? I look forward to playing with this one. It's been said, but I think this card is going to be very good with most sifters and a crucial engine component. Its an easy choice for a discard and it increases hand size the next turn. Multiple FH paired with multiple Warehouses has the chance to be really powerful. In my opinion the art is perfectly fine, or rather it appeals to me a lot. And I'm not even a dog person. This has to be my favourite for now. Wonder how good it'll be, though. I guess just like Moat, the reaction sometimes will and sometimes won't matter, but here it's not player dependent and you can very much control it yourself. Ah, probably much better than Moat. I don't really mind the choice in dog, but I can think of so many better ways to portray a faithful hound than in a forest with leaves falling to the ground around him. First of all, since when do leaves fall in nice tidy piles for you? They usually would blanket the ground. And the 3 leaves falling next to the center tree trunk look like they are attached to the trunk in some weird way. So I would give it a 7 for the dog, but 1 for the rest of the scene. My idea of portraying a faithful hound would be showing him at the feet of his master lying down by a fireplace. I guess the problem would be that if you are going to have your faithful hound go fetch something for you, you might prefer him to be alert and ready to go as seen on the card. On the other hand, since he first gets set aside, to picture him lying down and waiting for the next command from his master could be appropriate. well...i have to say this card is boring compared to other cards previewed. This is great! Just played a fun game with Faithful Hound and Torturer, and I was able to discard the Hound to get Ghost and Arena points, too. I'm trying to think of a way for the Blue Dog Rule to come up with the Blue Dog Card. Rules errata: when you buy this card, you must take it for a walk. Faithful Hound + Journeyman is hilarious. Not sure what to do with all of those in your hand, though. I think Stephert + Inheritance + Faithful Hound will be a pretty good trio.